In the Space Odyssey series when Dr. 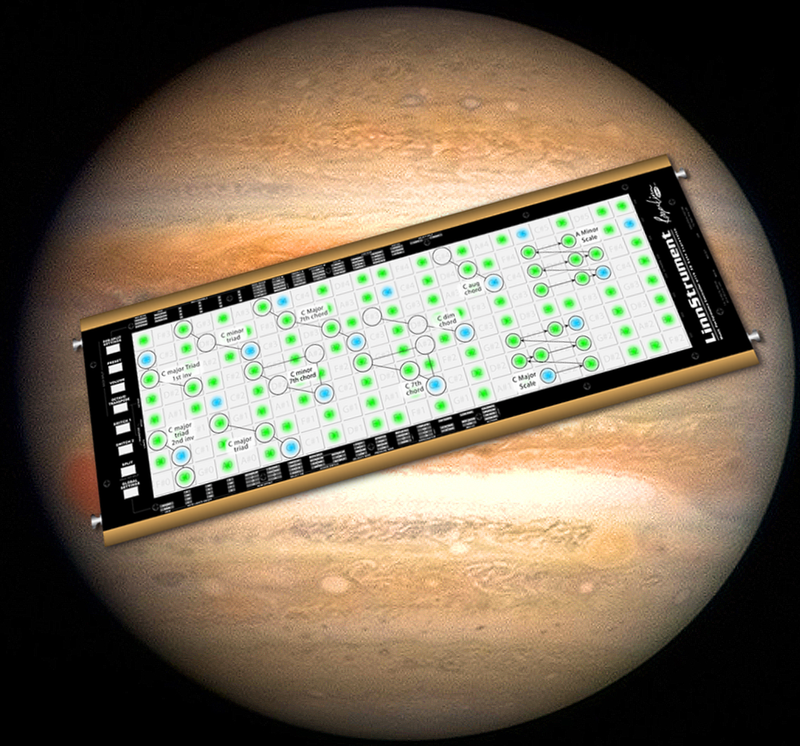 Bowman approached the monolith in space and was pulled inside, he observed that “It’s full of stars!” I was reminded of that quote when first looking at the chord and scale constellations (shapes) superimposed on the monolith-shaped LinnStrument in the Roger Linn Design website. Please take a moment to study that page, and then refer to the following graphic from the page as we dive into relevant concepts and put them into practice. Representing the default LinnStrument tuning, there are 17 blue LEDs on the Chord and scale shapes figure above, five of which are middle C.
The five middle C LEDs are easy to locate, as they appear near an imaginary diagonal line drawn from the upper-left corner to the lower-right corner of the playing surface. On a parallel line above the middle C LEDs are four blue LEDs that represent C on the treble clef (this blog will refer to these as treble C). On a parallel line above those are two blue LEDs that represent C above the treble clef (this blog will refer to these as high C). Similarly, on a parallel line below the middle C LEDs are four blue LEDs that represent C on the bass clef (this blog will refer to these as bass C). On a parallel line below those are two blue LEDs that represent C below the bass clef (this blog will refer to these as low C). Please take a moment to locate all of these C LEDs on the Chord and scale shapes figure above. Because the default LinnStrument tuning uses a perfect fourth musical interval between each row, any given note pad on the playing surface is a perfect fourth (five semitones) higher than the note pad directly below it. Looking at the Chord and scale shapes figure again, notice for example that the note directly above each C is always an F. By extension, the musical interval between any two note pads on the playing surface is the same as any other two note pads that have the same spacial relationship. For example, the note directly below and two columns to the right of a note pad is always a descending minor third musical interval. 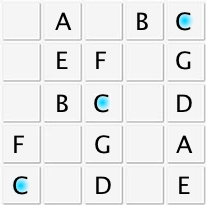 As a result, notice on the Chord and scale shapes figure that when the starting note is C, the note directly below and two columns to the right is always an A. By familiarizing yourself with the spacial relationships on the playing surface of the musical intervals in the following figure, you can locate all of the notes in the vicinity of a given note pad. This is useful for identifying notes relative to a C LED, or relative to a note currently being played. The Chord and scale shapes figure suggests a pattern for playing a major scale in a single octave. That pattern is also represented by the C major scale in the top three rows of the Natural note relationships to C LEDs figure shown previously. 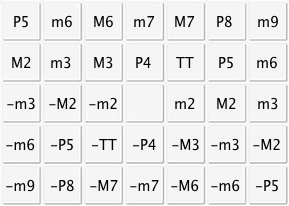 There are, of course, additional patterns for a single octave major scale, one of which is represented by the C major scale in the bottom three rows on that same figure. A two octave major scale may therefore be played by combining these patterns as shown in that figure. These ideas for playing major scales may be applied to other kinds of scales as well. Please take another look at the Chord and scale shapes figure, noticing that it suggests shapes for some commonly used chords, including a major triad in all three inversions. 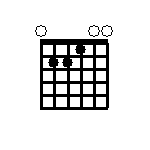 There are, of course, additional shapes possible for the chords shown in the figure. Guitar players may find some of these shapes familiar, namely the shapes that are played on guitar strings 3 and lower. For example the shape of the fingered notes in an open E chord on the guitar is the same as the major triad 2nd inversion on the Chord and scale shapes figure. When playing chords and scales on LinnStrument, it is beneficial to experiment with various fingerings, including the use of thumb and pinky (little finger). You’ll find that some fingerings are more comfortable than others, increasing the potential for playing accuracy. You may also find, as I do, that the pinkies are very useful in some chord and scale shapes, but they require extra practice to approach the strength and accuracy of other fingers. In keeping with the theme of this article, I’d like to play for you a well-known piece from Stanley Kubrick’s 1968 film 2001: A Space Odyssey on LinnStrument. This is the initial fanfare, entitled “Sunrise”, from Thus spake Zarathustra (Strauss), which demonstrates some of the concepts discussed in this article. I’ve taken the liberty of annotating the triads and their inversions in the video. This entry was posted in Intervals, LinnStrument, Scales, Triads and tagged LinnStrument on May 7, 2015 by javafxpert.